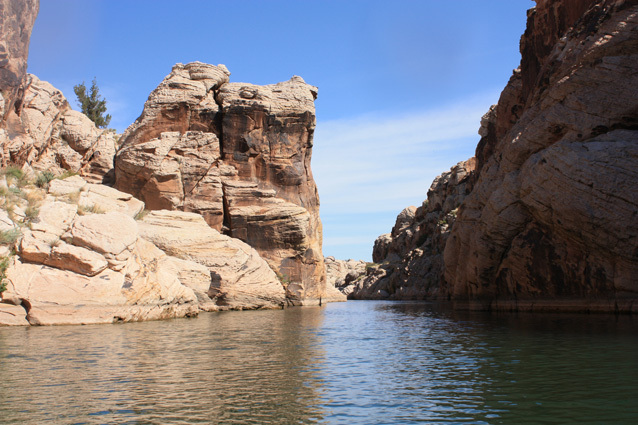 Clear Creek Reservoir is located about 5 miles southeast of the town of Winslow in northern Arizona. I had seen photos of the lake posted by a friend who lives there and had to go check it out for myself. Clear Creek was dammed up in the 1930's just before it reaches the Little Colorado River. Today, the waters back up into the narrow Clear Creek canyon for several miles. Power boats are allowed on the lake with no power restrictions. But on the day that I was there, there were no other boats south of the Highway 99 bridge. I launched from the picnic ground on the east side of the lake. The canyon walls of cross-bedded sandstone are pretty spectacular. Unfortunately, close to the bridge they are coated with graffiti. The lower canyon is popular with cliff jumpers and rock climbers. Many of the climbers climb without ropes, using the water of the lake as their cushion if they should come loose from the rock. About 2 miles up the lake, the ruins of an old railroad pump station can be seen. I have another page on that site here. There was also an impressive pretroglyph panel to be seen. There are very few sandy take-out places. One is at the pump station. On the day that I was there, Clear Creek was running well at the upper end of the lake. I forgot my gps, but estimate that my paddle up the lake was about 3 miles.